Solar energy is getting more and more popular and part of the reason is because as the technology improves, the cost goes down. A lot of people look at solar energy as a way to greatly reduce their electricity bills while also doing something good for the environment, but people are also concerned about some of the possible drawbacks. On this page we’re going to look at the solar energy pros and cons and then you can decide for yourself whether you think investing in a solar power set up would be a good idea. Solar energy is renewable and sustainable. As long as the sun rises every morning, we will have the potential to harness some of that energy for our own uses. Scientists estimate that the sun will continue shining for at least another 6.5 billion years, so there’s plenty of energy for the taking. Fossil fuels on the other hand are a finite resource. The more we use them, the harder it is to get more of them, and because of that, the price of fossil fuels will continue to rise. And at some point, there won’t even be any fossil fuels left for us to use. Solar is a clean energy source. It is true that in the manufacturing of solar panels, there may be some harm to the environment, so you may want to buy your solar panels from a reputable, ecologically friendly company. However, once you have your solar panels installed, you’ll be generating electricity without burning anything and contributing to air pollution or releasing greenhouse gases. Solar power can help you reduce your electricity bills. While it’s true that there is an upfront cost involved with setting up a solar power system, once the system is in place you’ll be generating electricity at no additional cost. After a number of years, your solar setup will pay for itself and then you will be effectively generating free electricity for many years to come. You can supply power to remote areas. If you want to get completely off the grid and not rely on a local utility company, solar power can make that happen. For some people who live in remote areas, a solar power system will actually be a much less expensive option. If you live in a remote area, the cost of bringing electricity from the utility company to your property can be extremely expensive. A solar energy system could be your best option. Solar energy systems require little maintenance. Because there are no moving parts in a solar energy system, they require very little maintenance. Your solar panels will need to be cleaned a few times per year, and you may need to replace a faulty component every once in a while, but a solar energy system can last for 20 years or more with virtually no maintenance. You’re not producing any power at night. One of the obvious drawbacks to solar energy is that when the sun is not shining, you’re not producing any electricity. If your solar energy system is tied to the grid, you will be generating your own electricity during the day, when electricity is most expensive, and you’ll be using electricity from your local utility company at night, when it’s least expensive, so that is a bit of a benefit. If your solar energy system is off grid, you will have to invest in batteries to store electricity for use at night. Storing electricity can be expensive. If you are off grid and you need to have a battery bank, the batteries and other components can add significantly to the initial cost of setting up your solar energy system. The initial cost. That leads us to another major drawback, the initial cost of setting up a solar energy system. While it’s true that solar power can save you money in the long run, you’re effectively paying for your electricity upfront, and most people don’t have many thousands of dollars lying around to do that. You may have to borrow money from a bank in order to get started with solar energy. Like with anything, there are pros and cons to solar energy, but for a lot of people, the pros greatly outweigh the cons and with prices continually coming down, solar energy is becoming a viable option for more and more people. 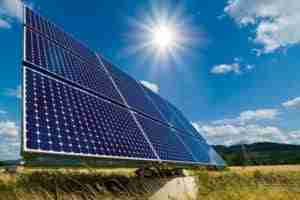 Next post: What Is Solar Energy? Previous post: How Much Does Solar Power Cost?